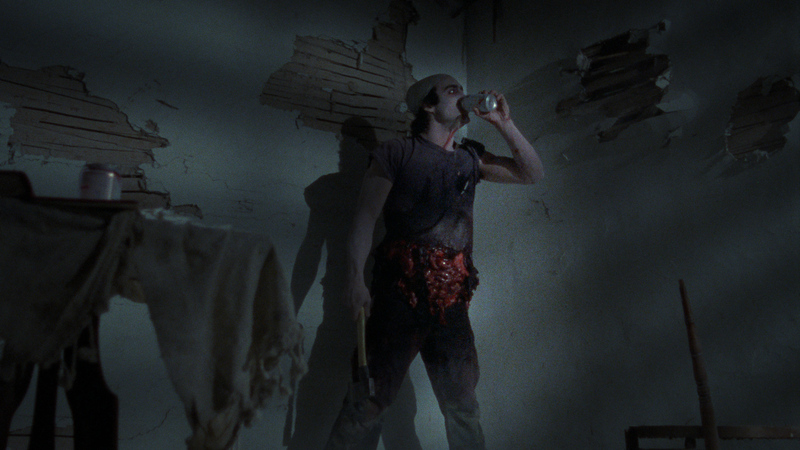 Vinegar Syndrome brings Dead Dudes Home At “The House On Tombstone Hill”, a slasher gem from Troma that lacks substance but satisfies gorehounds. I hit play on my Blu-ray player and was pleasantly surprised to see the title card “Lloyd Kaufman and Michael Herz present” appear on my screen. A bit of research showed that Troma originally distributed the bloody mayhem I was about to watch — THE HOUSE ON TOMBSTONE HILL aka THE DEAD COME HOME aka DEAD DUDES IN THE HOUSE. 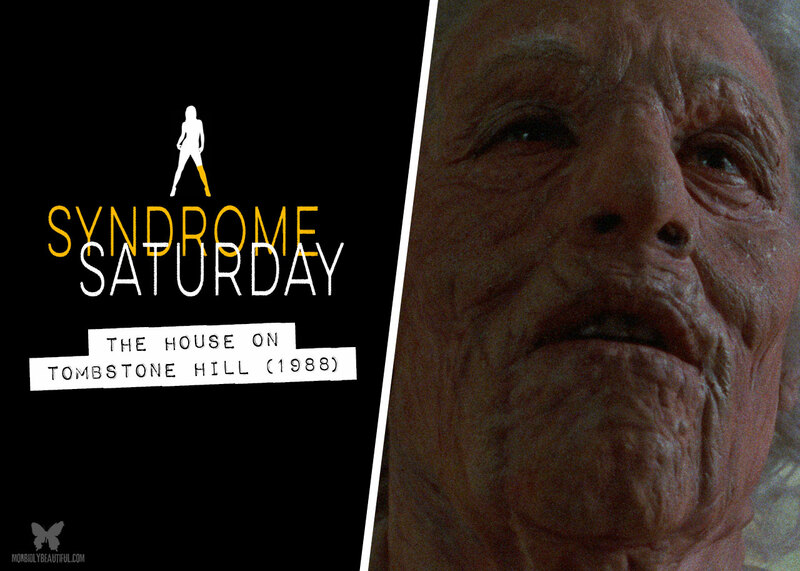 THE HOUSE ON TOMBSTONE HILL, written and directed by James Riffel, is about as meat and potatoes as a horror film gets. A group of friends journey to a dilapidated house out in the middle of nowhere to restore the home and make it their crash pad. Once on the grounds, one of the group destroys a tombstone they find in the weeds, awakening a long-dead old woman and her daughter. The friends enter the house and find that once inside, the house will not let them leave. The old woman begins to kill the group of friends, and each victim reanimates as a kind of low-key murdering deadite. There’s little else to the story, not even a backstory explanation as to how this woman and her daughter are reanimated from the dead or how their victims are reanimated. It’s a straight, in-your-face hack and slash horror movie. What THE HOUSE ON TOMBSTONE HILL has going for it is plenty of blood and inventive kills. Each murder, whether done by the old woman or the reanimated friends, is more creative and gruesome than the previous kill. If you like splatter films, THE HOUSE ON TOMBSTONE HILL is the film for you. The acting varies from adequate to teeth gratingly bad, but nothing that really detracts from the experience of watching the movie. In reality, fans are going to watch this for the gore, because there’s not much else going on in this movie. The special features are a mixed bag. The film looks fantastic and shows a little bit of grain that gives it that old-film feel. Some restored and scanned films lose the grain in the restoration process, and end up losing some of the character these older films have. The “Three Dead Dudes” featurette is a series of video interviews with three of the actors from the movie. The audio interview with director James Riffel runs with still images from the movie scrolling on the screen. But it sounds like the interview was done over a bad phone line connection, and for a 45-minute interview it’s tough to sit through. 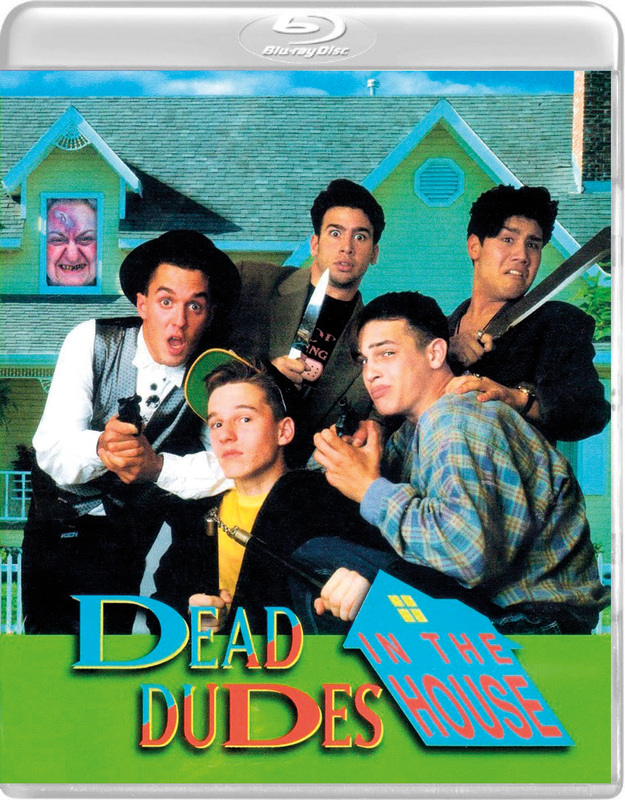 The reversible cover artwork includes the Troma home video release artwork and the alternative title, DEAD DUDES IN THE HOUSE. The artwork looks like Troma was trying to capitalize on the look of movies like HOUSE PARTY. Take a close look at the DEAD DUDES IN THE HOUSE artwork and you’ll notice a few things: none of the men on the cover are in the movie, the old woman in the house window doesn’t look anything like the old woman in the movie, and the house in the background isn’t the same house as in the movie. For more information and to purchase THE HOUSE ON TOMBSTONE HILL, visit Vinegar Syndrome at www.VinegarSyndrome.com.